I have been anxiously anticipating the newest edition of Jim Trelease’s Read Aloud Handbook. The waiting has reminded me that I need to be reading and reading and reading with my kids. But if it’s not bedtime, then sometimes My Little Reader is resistant to sitting down with a book (he would rather be playing Legos). So I’ve been trying to get creative with reading to him in moments where he doesn’t have much else he could be doing. I’ve been trying to catch him as a captive audience. And in this digital age we’re living in, that’s tough! 1. In the bathtub. Rub-a-dub-dub, they can’t easily escape from the tub. I figured that even if my son was playing with his toys in the tub, he still might catch some of what I was reading him. And it turned out that he became more interested in the stories than his toys. 2. The bathroom. We have to do “sit time” every day with our son right now. I could just send him in there to sit by himself. Or I could steal those moments to sneak in a story while he’s still and stuck! 3. Appointments and waiting times. I know the go-to these days is the smart phone or Ipad to entertain in these moments. But what if you just happened to “forget” to bring those one day? Or you loaded them up with some awesome storybook apps? 4. The car. I don’t utilize my car enough lately. Now I can’t read while I’m driving. But my kids will almost always sit and look at a book while they’re strapped down in the car. Keep the car stocked with some high-interest books. For my kids that would look like comic books and favorite character stories. Maybe some look-and-find type books. 5. The table. Have nothing to talk about at the kitchen table? Or maybe you’re like our family and you need to keep the bickering to a minimum. Whip out a book and start reading. Sure, it sometimes makes it hard to eat your own meal. But when the kids finish eating and clear the table you can finish your own dinner in quiet solitude… maybe with your own book to read! 6. While they are doing a favorite activity. My Little Reader will absolutely listen to a story if a slide up next to him with a book while he’s building with his Legos. Especially if it’s a Lego City story. I know not all activities allow this, but what about while they’re painting or coloring, playing with dolls, or putting together a puzzle? 7. Cleaning time. Hopefully, your kids help out around the house and you (and/or your spouse) are not stuck with all the chores yourself. My kids have daily and weekly chores they help with. And chore time might be a lot more pleasant for us all if I pulled out a book and took the time to read to them while they dusted or folded laundry. They have to do it anyway, might as well make the most of the moment! Who knows, they might come to look forward to cleaning time! 8. 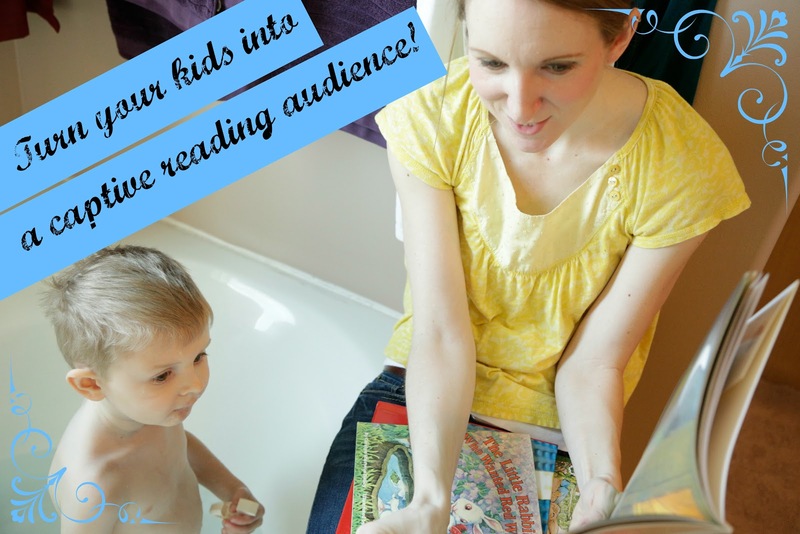 Create special reading moments. Maybe new traditions or fun surprises that your child might then associate with books in the future – like a reading picnic. I think I might try some breakfast and lunch picnics in the yard this summer with books! We even have little tents I made last summer that would make this extra fun. How fun would it be for them to wake up and find a picnic and stories waiting for them at breakfast!